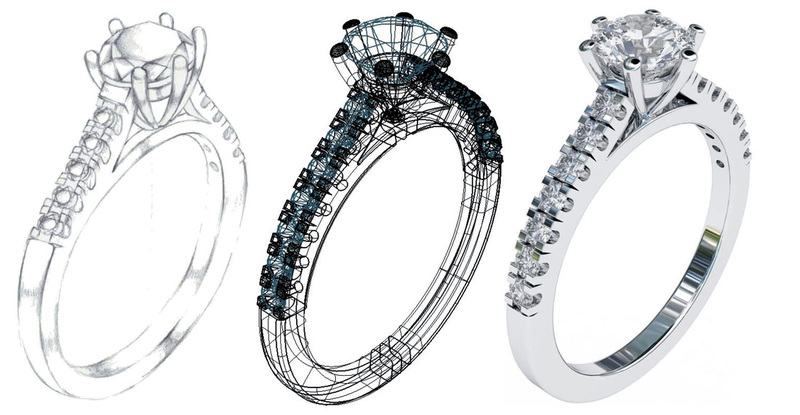 CAD (Computer Aided Design) is a very powerful software which allows you to design anything from Boats, cars, aeroplanes etc and in our case jewellery and the modern cad packages can also photo render a file so realistic you would think it had been made like the two rings here. We are able to produce almost any piece of jewellery quickly and very accurately using Cad software on the premises, your designs can often be altered and changed several times before you are finally happy with your piece of jewellery with very little cost involved, only when you are completely happy with the design and the rendered image like the one shown below on the right do we move to the next stage! Which is to build a wax using a 3D printer which when built, that is what we use to cast into your chosen metal. The wax is also what the item will look like when it is cast so again if you wanted to have a visual idea on your design you can see it before we move on to the casting process. This is a ring we made using the stones out of a customer’s brooch she no longer wanted to wear; it was set with diamonds and a very impressive 11ct blue zircon centre stone! What she wanted was a nice ring, so we started with a chat and some rough sketches and using reference books and Google images, she settled on a cluster which enabled us to use all of the stones out of her brooch. 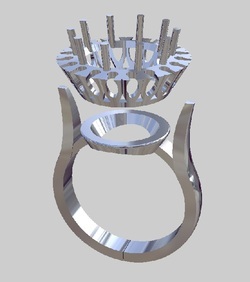 We initially built the ring in cad which we allowed us to create a cad image on the left which we sent to the customer for approval, she was happy with the result so gave us the go ahead to make the ring for her. We were also asked to make matching earrings also set with blue zircon and diamonds.